Be the first to share your favorite memory, photo or story of Claude . This memorial page is dedicated for family, friends and future generations to celebrate the life of their loved one. Claude Adams Jr, 74, of War WV, went home to be with the Lord, Saturday, April 6, 2019 at Chippenham Hospital, Richmond, VA. Born September 15, 1944 in Warriormine, WV, he was the son of the late Claude Sr and Lela C. Sexton Adams. He was a graduate of Big Creek High School. He served in the Army for three years. He was a member of the War Church of God. He worked with Project Life Saver. He was on the board of directors for the McDowell County Ambulance Authority. He was a member of the Berwind Community Watch. 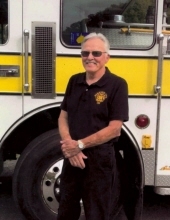 He was the Fire Chief of the Berwind Volunteer Fire Department for 33 years and a member of the McDowell County Firefighters Association; serving as Treasurer for 25+ years. In addition to his parents, he was preceded in death by one brother in law Leonard Dougaree, his mother and father in law Darrie and Pat Foster, as well as Johnny and Louise Veselosky who were very dear to his heart. Those left to cherish his memory are, his wife Joyce Adams of the home, one son Kevin James Adams and companion Maria Frazier of War, WV, one daughter Heather Claudette Neese Gammon and husband David of Tazewell, VA, two grandsons, Luke Christian Neese of North Carolina and Bryson James Adams of War, WV, one granddaughter, Cierra Brooke Adams of North Carolina, one sister Betty Dougaree of Chester M.D. , two brothers, Bill Adams and wife Wilma of Berwind, WV, James Adams and wife Constance of Tazewell VA, along with many dear nieces and nephews. Funeral Services will be conducted Thursday, April 11, 2019 at 11 A.M. from the War Church of God in War WV, with Pastor Leroy Richards officiating; burial will follow at Hartwell Cemetery in Hartwell WV; where Military Grave Side Rights will be conducted by the V.F.W Post 1144 Iaeger WV. Friends may call Wednesday, April 10, 2019 from 6 P.M. to 9 P.M. at the War Church of God in War WV. Pallbearers will be members of the local fire departments. To send flowers or a remembrance gift to the family of Claude Adams Jr, please visit our Tribute Store. "Email Address" would like to share the life celebration of Claude Adams Jr. Click on the "link" to go to share a favorite memory or leave a condolence message for the family.